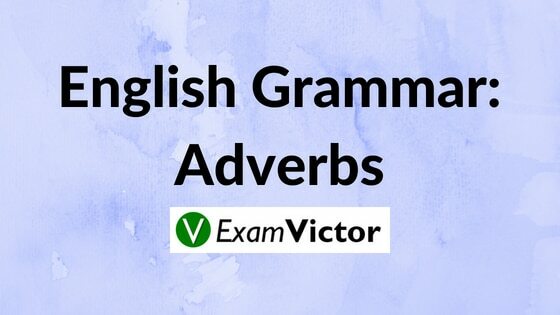 Adverbs are one of the basic elements of English Grammar. It is an important topic as adverbs are directly or indirectly part of almost all the competitive exams ranging from SSC CGL till CAT level. So, the concept of adverbs should be clear in your mind. The following post will help you to have a better understanding about it. She has lived on the island all her life.She still lives there now. She takes the boat to the mainland every day. She often goes by herself. She tries to get back before dark. It’s starting to get dark now. She finished her tea first. She left early. She drives her boat slowly to avoid hitting the rocks. She shops in several stores to get the best buys. One of the hallmarks of adverbs is their ability to move around in a sentence. Adverbs of manner are particularly flexible in this regard. Solemnly the minister addressed her congregation. The minister solemnly addressed her congregation. The minister addressed her congregation solemnly. Before the main verb: I never get up before nine o’clock. Between the auxiliary verb and the main verb: I have rarely written to my brother without a good reason. Before the verb used to: I always used to see him at his summer home. He finally showed up for batting practice. Ernest Hemingway is often held up as an example of a great writer who detested adverbs and advised other writers to avoid them. In reality, it is impossible to avoid adverbs completely. Sometimes we need them, and all writers use them occasionally. The trick is to avoid unnecessary adverbs. When your verb or adjective does not seem powerful or precise enough, instead of reaching for an adverb to add more color, try reaching for a stronger verb or adjective instead. Most of the time, you’ll come up with a better word and your writing will be stronger for it. From the above explanation, we can clearly understand the definition of Adverbs, Kinds of Adverbs, Positioning of Adverbs and When, Where, How & Why to avoid Adverbs. Hope you liked this post. For more posts related to English, click on the links mentioned below. For English Preparation, click here.